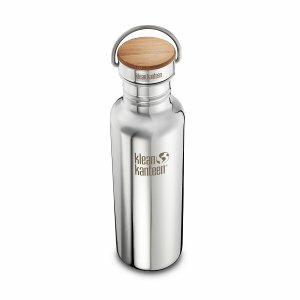 The Klean Kanteen 27oz Mirrored Reflect & Bamboo Cap water bottle is made of 18/8 food-grade stainless steel that doesn't retain or impart flavors in your water. The shiny Mirror finish of this Reflect water bottle symbolizes Klean Kanteen's deep commitment to continued innovation, that delivers value and quality with integrity. The 27oz Reflect Mirrored Finish goes through an additional electropolishing process to make it extra shiny. This Klean Kanteen 27oz water bottle is a healthy and eco-friendly alternative to plastic water bottles. Made of 18/8 food-grade stainless steel, The Reflect does not retain or impart flavors in your water. Together, the bamboo cap and stainless steel bail deliver unparalleled strength and durability. This 27oz water bottle is also known as part number K27SSLRF-MS. The rounded corners of this Klean Kanteen Reflect & Bamboo Cap container, makes it easy to clean without hard angles that trap dirt, germs or bacteria. 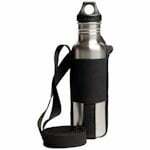 For portable convenience, this 27oz Klean Kanteen Reflect will fit into our 27oz Klean Kanteen Sling. Klean Kanteen recommends that you only hand-wash your bamboo cap to protect it from high temperatures and harsh detergents. This Mirrored finish Klean Kanteen Reflect can be used to store other cold drinking liquids, but should not be used to store hot liquids or to freeze liquids. This reusable water bottle is 100% recyclable without using paint or plastic.